Capturing the glowing clarity of crystal light, Omnia Crystalline illuminates, reflects, and reveals a woman's unique radiance, her femininity, her beauty - the inexpressible, irresistible lightness of her being.Its fresh musky woody fragrance with notes of bamboo, nashi pear, lotus flower, and balsa wood make it irresistable to a woman with confidence. An ideal gift in the season of love. 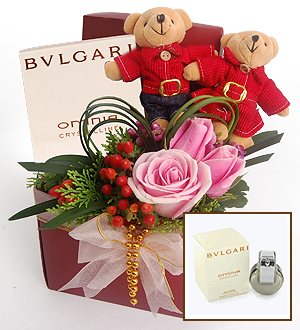 Fragrance comes with two cutesy bears and Roses. Applicable for delivery within Klang Valley(Kuala Lumpur, Petaling Jaya, Selangor, WP) only. For other States, fresh flowers will be replaced with artificial flowers or non-flower gifts. Kindly provide at least 3 days notice for outstation delivery.